From State Highway 1 you can take the scenic route and take the first road to the left at Hikurangi (signposted to the Tutukaka Coast). Turn left in Hikurangi towards the coast and follow the road past Sandy Bay, Woolley's Bay, Whale Bay, Matapouri and the Tutukaka Marina. As you go up the hill after the marina take the first road on the left called Tutukaka Block Road. Follow this road till the end (Whangaumu Bay) and turn right at the T-junction. The Sands Motel is on the left. If you prefer the less winding route then follow the signs to the Tutukaka Coast through Kamo (right off State Highway 1) and then the directions through Ngunguru above. From State Highway 1 follow the signs to Tutukaka and the Whangarei Falls via either Kensington Avenue or Hatea Drive. Drive through Ngunguru and continue up the hill past the lookout. On the way down the hill towards the Tutukaka Marina turn right into Tutukaka Block Road. Follow this road till the end (Whangaumu Bay) and turn right at the T-junction. The Sands Motel is on the left. 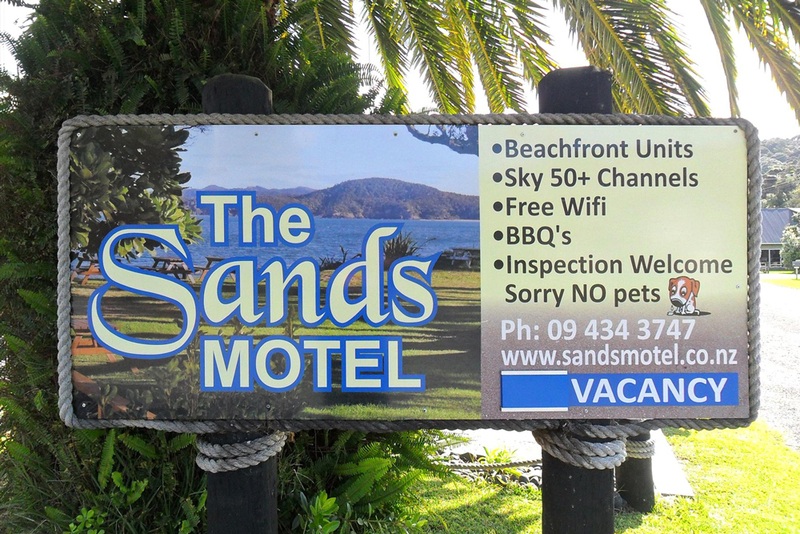 Please note that shops and restaurants are not accessible by foot from The Sands Motel so we recommend that you purchase your groceries before you arrive at Tutukaka (5min drive) or in Whangarei city.